Should the Braves Consider Moving Teheran? Such commentary has pushed other Braves fans in a different direction. While more focused on a different pitcher, a frustrated Aaron Kirby remarked on Twitter this morning, “In fact, Julio and Folty have pretty similar stats this season. When are we moving Julio to the pen?” This refers to a common refrain from Braves fans – including ones at this blog – that Mike Foltynewicz profiles better as a reliever. But Kirby rightfully points out that both the flame-throwing right-hander and Teheran share many of the same issues. Why does one get talked about moving to the bullpen and the other doesn’t? I would say for a variety of reasons, but the biggest is perception. People have long felt Folty’s stuff was better suited for the bullpen. Nobody held the same regard for Teheran, who was considered a potential front-of-the-rotation arm. But five years into his career, is Teheran merely a decent enough rotation filler? Should the Braves consider possibly trading Teheran now rather than pay him at least $20M (including a 2020 buyout) through the 2019 season? While many will scoff at the idea out of practice, it’s worth considering. When Teheran signed a $32.4M extension in mid-February of 2014, he was coming off his first full-season in the majors. The deal effectively bought out the remaining five years of arbitration, a year of free agency, and potentially a second year with an $12M option for 2020. Along with the Andrelton Simmons‘ extension, both were very aggressive moves by the front office as they attempted to get ahead of the horse for what appeared likely to be very expensive arbitration years for the two young players. The plan was to pay them a bit more now but potentially save money later on. In turn, the players received financial security. Simmons would later be traded and while Teheran was often thrown around as a potential arm to be dealt in trade talks, he stuck around as the Braves went into a full rebuild. Since signing the extension, he’s been equally good and bad. In 2014 and 2016, he posted a matching WAR, according to Fangraphs, of 3.2 in both seasons. But then, his WAR fell to 1.1 in 2015 and it’s unlikely to even reach that this season. In fact, since he signed the extension, his fWAR ranks just outside the Top 50 qualified starters in baseball at 7.9. That’s lower than Tanner Roark, Mike Leake, and Bartolo Colon. It’d likely be lower if not for Teheran’s durability. He’s tossed the tenth most innings since the beginning of 2014. Nevertheless, the last four years haven’t exactly lined up for Teheran like anyone had hoped. Further, there is a reason to believe his 2016 bounce back season had a little too much luck in it. Lefties had a .247 BABIP against him that season, 35 points below his career average when facing left-handed hitters. His production against lefties has long been an issue that has limited Teheran, who has yet to develop a pitch to keep them honest. In turn, lefties bash him around to the tune of a 5.05 FIP over his career and it’s only worsened as time has gone on (5.67 FIP since the beginning of 2015). Nearly 35% of batted balls since 2015 are classified as hard-hit, according to Baseball Info Solutions. To put it another way, a third of all balls left-handed batters put in play are scorched around the park. Some are caught, but too many of them find holes in the defense – or worse, become a souvenir for a fan in the outfield bleachers. Teheran’s problems against left-handers start with one key issue: his fastball loses much of its effectiveness against them. About a quarter of all swings on his four-seam fastball against right-handers are whiffs. That number falls about 10% against left-hand batters. Without a fastball to get ahead in the count, Teheran can’t use his secondary pitches to induce weaker contact – or get more whiffs. Further, we don’t see much of a drop in whiffs on Teheran’s breaking pitches despite how many plate appearances in a game a right-hand hitter might have against Teheran. Against left-handers, his slider and curve see great declines in whiffs-per-swing after the first time through the order. That suggests that after left-hand batters get a read on his breaking pitches, they learn to lay off the ones they can’t hit. The ones that they do…well, they don’t always land. Let’s pull back for a second because it’s definitely worth mentioning that Teheran doesn’t turn 27 until the end of next January. Further, this is a pitcher with a pair of 3-win seasons during his career, something that’s happened just nine times over the last decade for the Braves and almost certainly won’t occur this year. Ignoring the reasons the Braves gave him an extension in the first place is a disservice to Teheran’s time in the majors. But two other pitchers show up on that list of 3-win guys since 2008 and they should scare Braves’ fans – Jair Jurrjens and Tommy Hanson. Much like Teheran, they were, at different times in their career, expected to front line a Braves’ rotation for the next half-decade. And while we can talk about injuries and personal demons, another issue that developed for both pitchers might also serve as a warning sign for Teheran. Declining velocity doesn’t always mean something bad, but it can be a problem for a pitcher moving forward. In his rookie season of 2008, Jair Jurrjens averaged 92.4 mph on his four-seamer and 92.7 mph on his sinker. By 2011, he had lost three mph on both and a year later, he would be non-tendered by the Braves. He’s made three starts in the majors since. During Hanson’s rookie year, he averaged 92.7 mph on his four-seamer and 92.4 mph on his sinker. During his one 3-win season, he added a tick more velocity on the four-seamer but lost some on his sinker. The added velocity on his four-seamer was gone the next year and in 2012, it fell to 90.7 mph. That was his final year with the Braves. With Teheran, his velocity dropped after his rookie season from 93 mph to 92.2 mph. It stayed roughly the same in 2015, but he’s continued to bleed a little velocity off in the two years since. In five years, he’s gone from an average 93 mph to 91.9 mph. He’s just 26 years-old. Now, the loss in average velocity is not a massive alarming discrepancy, but at his age, losing velocity is something to keep an eye on. Could the Braves need, as Kirby also said, a new pitching coach? Well, they went down that route last winter when they sacked Roger McDowell in favor of Chuck Hernandez. It’s unlikely that the Braves will shed Hernandez after just one year, though Ken Rosenthal recently suggested some radical moves might be on the horizon by an increasingly frustrated front office. Let’s circle back to those questions I asked earlier: is Teheran merely a decent enough rotation filler? Should the Braves consider possibly trading Teheran now? To the first question, I think there is a good chance of yes, Teheran is just a durable innings eater. According to Baseball-Reference, Teheran’s most similar pitcher through 25 was Scott Sanderson. A veteran of 19 years in the majors, Sanderson got to the bigs at 21 years-old with the Expos and a lot was expected from the right-hander. Ultimately, he never received a Cy Young vote, was named to just one All-Star Game, and started two playoff games in which he got beat around a good deal. Nevertheless, he was a good rotation piece for the Expos and then the Cubs before settling into a more nomadic experience over the final seven years of his career. Essentially, he was the Ervin Santana of his time. Could that be Teheran’s future? Or could he be a starter that does figure it out finally in his later 20’s more than he ever had before? Certainly, it’s a possibility, but is it one the Braves should count on? Is it one that Teheran has shown much reason to expect over the last three years? Maybe the best argument against trading Teheran is the one I have made before. Trading him this offseason might be the worst time to do so. His value has taken a big hit this season and moving him now could be considered selling low on a player who, again, has had two 3-win seasons in his young career. General managers can get over missing the right window to trade a pitcher – as Frank Wren did with Jair Jurrjens. What keeps them up at night is trading a pitcher who looks to be on the decline only to see them find it again in a new city while you took back a small return just to get rid of him. The second-best argument against trading Teheran is the same one that one might argue when we discuss moving Foltynewicz to the bullpen. Why move these guys when the rotation isn’t exactly pushing them out of the way right now? Inning eaters certainly have value especially in a young rotation prone to outings that require long relief stints. In addition, trading Teheran would have to be part of a series of moves aimed at shoring up the front-of-the-rotation. John Coppolella would have to rebuild the first three spots in the rotation this offseason without Teheran in the mix at an affordable rate. To sum up, this has been an exercise from someone who’s not sure what the answer is. I have decreasing confidence that Teheran will resemble the guy we once thought would headline a playoff rotation. At the same time, are the Braves in a position where they can actually trade Teheran right now? And even if they were, is now the right time to trade Teheran? Did the Braves already miss their window to maximize Teheran’s market value and now are better off keeping him for some level of consistency as he eats innings every fifth day? All the while, they are merely hoping to see another unsustainably low BABIP against left-hand batters to increase Teheran’s production. There’s no easy answer here. My belief is that the Braves will wait, see, and hope. I guess their fans are left with the same options. Keeping Teheran to start The 2018 season is a no-brainer! Better/consistent defense would help Teheran avoid long innings that increase his pitch count. 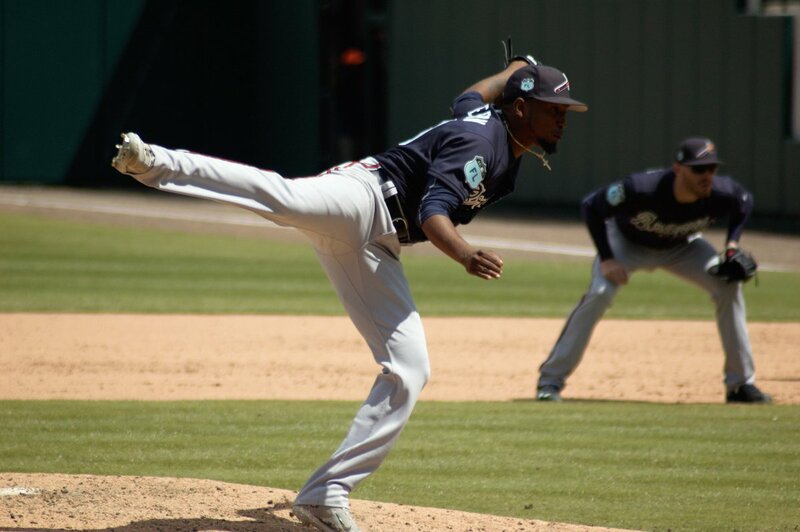 The bottom line is that unless we are willing to spend HUGE in free agency OR burn through our stash of highly touted prospects….Teheran is our 'ace'..UNTIL some of our prospects show at The MLB level that they are better than Teheran! 4/5 Fried/Sims/Newcomb (depending on 1. if Fried is healthy enough to consistently pitch 6/7 innings a start OR Braves management in the offseason could decide to steer him in an Andrew Miller-like role. 2. Both Sims AND Newcomb need to develop a 3rd pitch to FINISH hitters off/keep them off balance. How the 4th/5th spots in the rotation to start The 2018 season plays out, depends on a number of factors). If Dickey decides to retire, good for him. However if he wants to pitch in 2018…we can pick up his $8 mil option and trade him to a team that needs an affordable innings eater at the back end of their rotation (for another lottery-like prospect flyer). I'd rather give the youngsters opportunities to show if they are what we need to accelerate our rebuild. I'd have Soraka and Allard open The 2018 season at Triple A (1. give them some time at Triple A to further show they are ready for The Majors. 2. Delay the starting of their service clock. 3. Have them in the wings ready to take the spot of anyone who gets injured/shows that they cant hack it in The Majors). Wisler and Blair are GARBAGE! They had their chances..neither has shown that they have what it takes to be playoff caliber starting pitchers! There's no way to predict how that starting 5 will shake out in 2018. However, I'm confident that having Soraka and Allard waiting in the wings will help ease/deal with any injuries/ineffectiveness that may arise from that Starting 5. 1. Folty/Teheran (one of them may be traded..depending on a number of variables). 5. Allard (with Fried filling an Andrew Miller-like role in the bullpen. While I'd rather see him become a stud starting pitcher….I have my doubts concerning his ability to stay healthy consistently as a starting pitcher. I would LOVE for Fried to prove me wrong). With Kyle Wright, Bryce Wilson and a number of others waiting in the wings at Double A and below….there is going to be SOME SERIOUS COMPETITION between 2018 and 2020 for who will hopefully lead/fill our rotation FOR YEARS TO COME/giving The Braves a chance to compete for a World Series Championship EVERY YEAR (similar to our 15 year run of success from 1991-2005). Again, it's tough to figure out exactly how things will play out. However with the sheer volume of high ceiling prospects we have….we've basically hedged our bets against variance/injuries/ineffectiveness/being 'flashes in the pans'/etc.